Your Wild Apricot account includes space to store files such as documents, pictures, and videos. You can link to these files from pages on your Wild Apricot site, or you can share a link to these files with others inside or outside your organization. To manage your files – upload, download, organize, delete, or rename them – you can go to the Files screen within Wild Apricot, or you can use WebDAV to access your files independently of Wild Apricot. Using WebDAV allows you to copy multiple files or folders at the same time. WebDAV is a method for remotely managing files over the internet, similar to FTP. With WebDAV, you can access files stored in your Wild Apricot account using the same interface as you do your local files. Your Wild Apricot account appears as another drive on your computer. 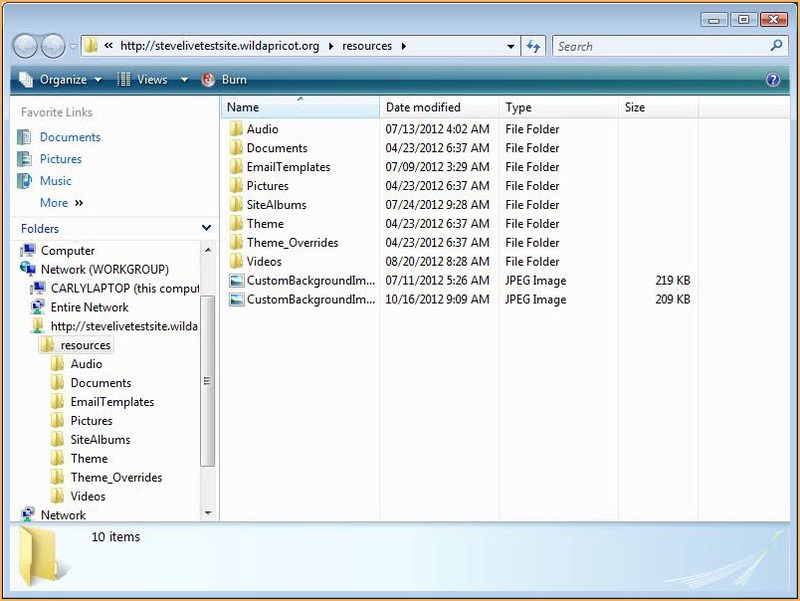 Once you connect to it, you can view and manage the folders and files stored within it. 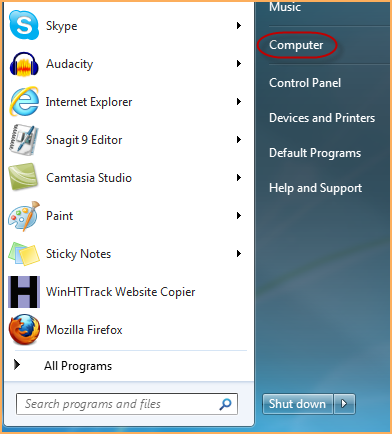 You can perform all the same actions – drag and drop, rename, delete – that you would on files and folders stored on your own computer. While you can also do this from the Files screen within Wild Apricot, WebDAV is much faster and easier, particularly if you are going to work with a large number of files. Your WebDAV address – http://your_site_url/resources or http://your_site_url:80/resources for Windows XP (where your_site_url is the URL of your Wild Apricot site e.g. stevelivetestsite.wildapricot.org). The email and password of a full site administrator. For secure access, replace http with https (only available for wildapricot.org domains). For more information, see Encrypting your site. The steps for setting up WebDAV varies according to your operating system. See one of the sections below for detailed instructions on setting up WebDAV on your operating system. You can move, copy, rename, and delete any file or folder in your WebDAV directory the same way you would for any file or folder stored on your computer. If you are using Windows XP, Windows Vista, or Windows 7, you can access your WebDAV files directly from applications such as Microsoft Office and Adobe Photoshop. Mac OS X does not support this. where your_site_url is the URL of your Wild Apricot site (e.g. 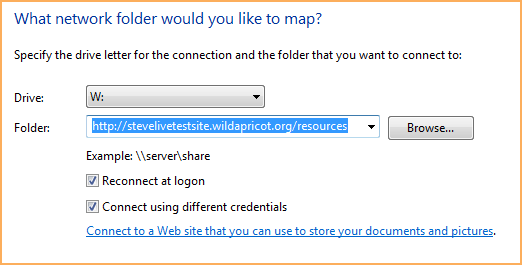 stevelivetestsite.wildapricot.org), file_path identifies the folder (including any subfolders) in which the file is stored, and file_name is the name of the file (including extension). For example, a file called logo.png in the Documents folder on stevelivetestsite.wildapricot.org would be referenced as _http://stevelivetestsite.wildapricot.org/resources/documents/logo.png_. Not all file types are supported by Wild Apricot. See Complete list of supported file types. Maximum allowed file size is defined by your subscription plan (see Functionality by billing plan). You cannot delete Theme folder. You cannot delete or move the user.css file. You cannot modify, delete, or move the customStyles.css file. The customStyles.css can only be edited from the Colors and styles screen. If you enter the wrong email/password you may have to wait about 20 seconds before trying to connect with the correct credentials. This is due to a bug in the built-in Windows WebDAV client which stores and keeps sending the same login details for about 15 seconds. 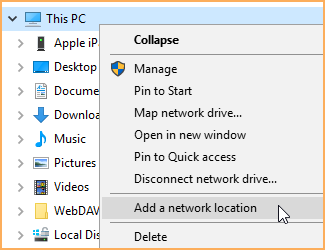 If your connection to WebDAV works but is slow, you may need to adjust your LAN Settings if you are using Windows. This setting is found in your Control Panel > Network and Internet > Internet Options > Connections. From this screen, uncheck the option to automatically detect settings. You can also use 3rd party WebDAV clients like https://cyberduck.io. Display the Windows File Explorer. 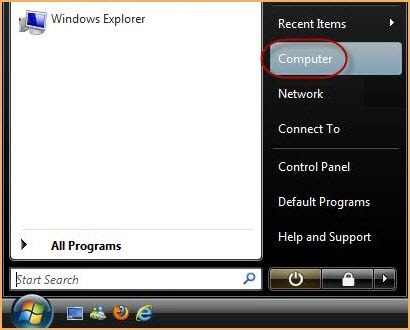 To display File Explorer, you can right click over the Start button and select File Explorer , or you can search for File Explorer by pressing the Windows key + S.
From the File Explorer, right click over This PC or Computer within the navigation pane on the left. From the pop-up menu that appears, select Add network location. Within the Add Network Location Wizard, click the Next button. 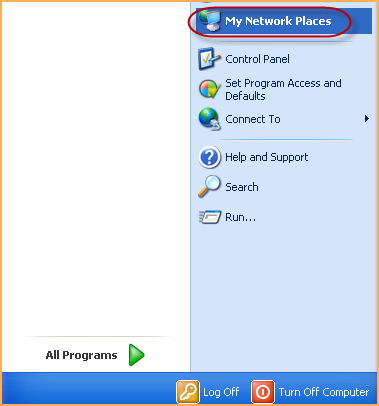 On the next screen, click the Choose a custom network location option then click the Next button. 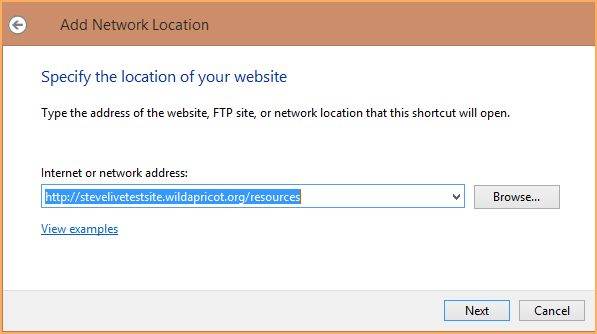 In the Internet or network address box on the next screen, enter http://your_site_url/resources (where your_site_url is the URL of your Wild Apricot site. For example, if your Wild Apricot site is stevelivetestsite.wildapricot.org, you would enter http://stevelivetestsite.wildapricot.org/resources. 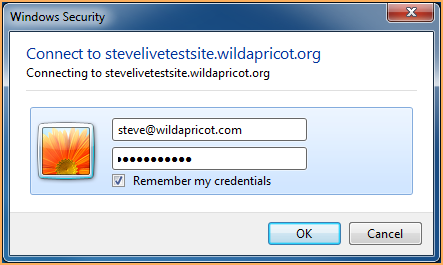 When prompted, enter your Wild Apricot email address and password, and check the Remember my credentials checkbox. When prompted, enter a name for your WebDAV connection (e.g. WebDAV to Wild Apricot site) then click Next. Now you should see a WebDAV drive that you can expand to view folders and files in your Wild Apricot account. You can access this drive in the future under the This PC or Computer listing in Windows Explorer. Display the Windows File Explorer. 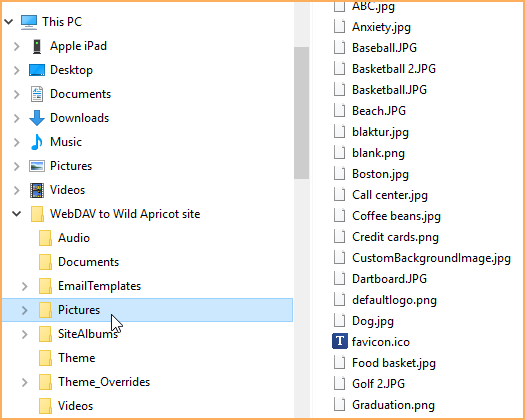 To display File Explorer, you can right click over the Start button and select File Explorer (Windows 8.1 or later), or you can search for File Explorer by pressing the Windows key + S.
When prompted, enter a name for your WebDAV connection (e.g. WebDAV to Wild Apricot site). 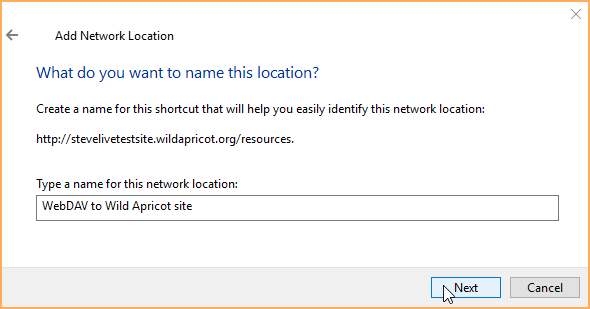 Within the Map Network Drive dialog, enter your WebDAV address: http://your_site_url/resources (where your_site_url is the URL of your Wild Apricot site e.g. stevelivetestsite.wildapricot.org). Click the two check boxes at the bottom. Enter your Wild Apricot email address and password. Click the Remember my credentials checkbox. 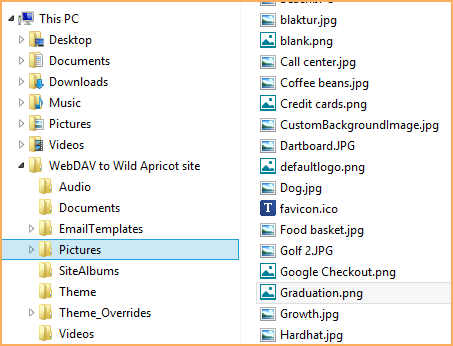 Now you should see a WebDAV drive that you can expand to view folders and files on your Wild Apricot account. You can access this drive in the future under the Computer listing in Windows Explorer. 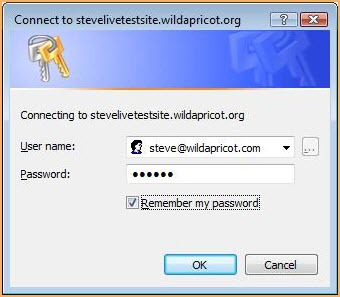 If your credentials are not accepted when you try to connect to your Wild Apricot account via WebDAV, you may have to set up the network drive again. To use WebDAV on a computer running Windows Windows Vista, you must install Microsoft's Software Update for Web Folders. You can download this from the Microsoft Download Center at: http://www.microsoft.com/downloads/details.aspx?FamilyId=17C36612-632E-4C04-9382-987622ED1D64. 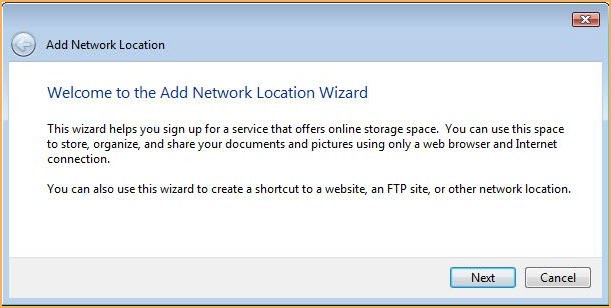 After you've downloaded and installed Microsoft's Software Update for Web Folders, you can map a network drive to your Wild Apricot account, then connect to the account. 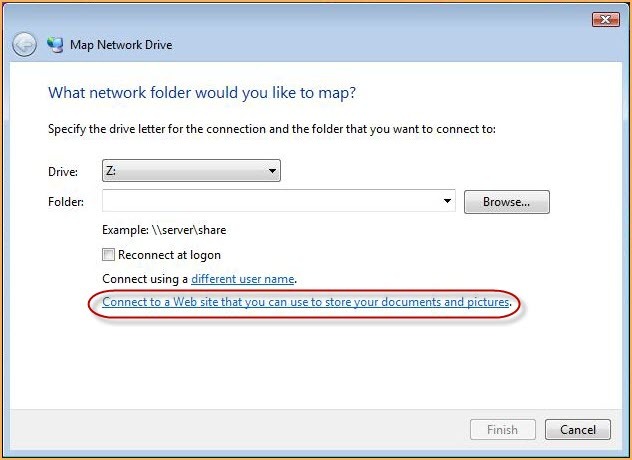 On the Map Network Drive dialog, click the Connect to a Web site that you can use to store your documents and pictures link. On the dialog that appears, click Next. 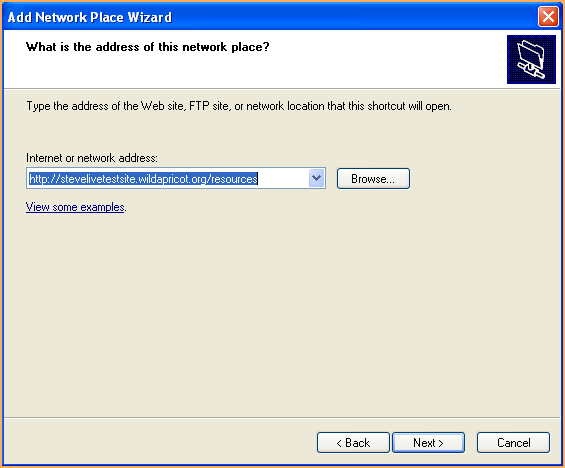 On the dialog that appears, select Choose a custom network location then click Next. 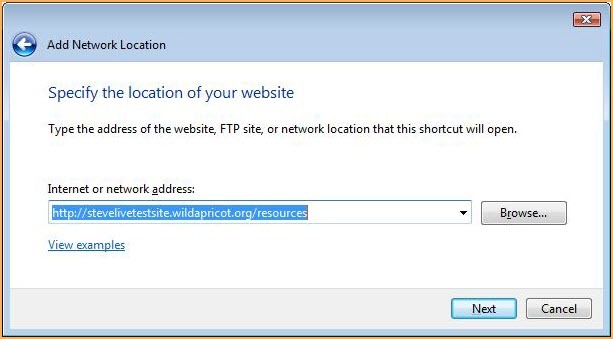 In the Internet or network address field, enter your WebDAV address: http://your_site_url/resources (where your_site_url is the URL of your Wild Apricot site e.g. stevelivetestsite.wildapricot.org), then click Next. Click the Remember me checkbox. 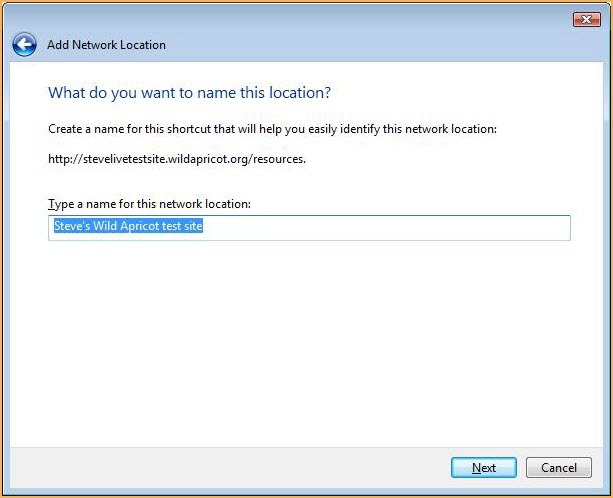 Give your new network location a name then click Next. Now, you should see a window displaying the files and folders in your Wild Apricot account. You can access these files in the future under the Network Locations listing in Windows Explorer. 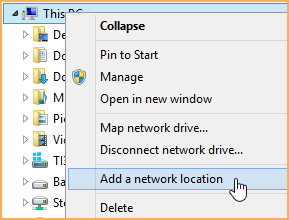 From the Windows Start menu, click My Network Places. 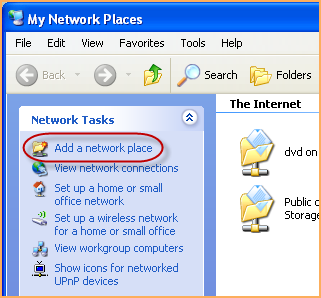 From the My Network Places dialog, click Add network place. On the next screen, select Choose another network location option then click Next. 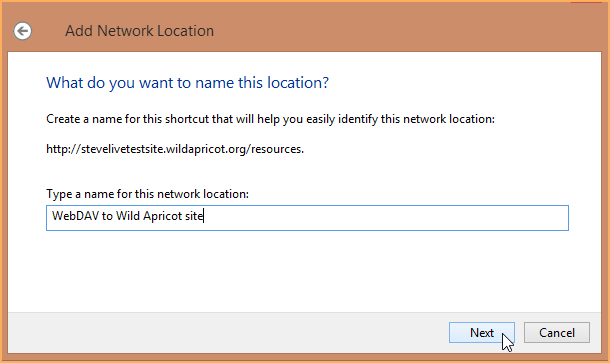 Enter your Wild Apricot email address and password then click OK.
Give your new network place a name then click Next. Now, you should see a window displaying the folders and files in your Wild Apricot account. You can access these files in the future under the My Network Places listing in Windows Explorer. If your credentials are not accepted when you try to connect to your Wild Apricot account via WebDAV, you may have to set up the network place again. If you have multiple people using WebDAV to connect to your Wild Apricot account from different computers, you may have to refresh the file listing – by pressing F5 on your keyboard – to view files or folders added by other users. In the Finder, click Go > Connect to Server, or press Cmd + K on the keyboard. In the Server Address field, enter your WebDAV address: http://your_site_url/resources (where your_site_url is the URL of your Wild Apricot site e.g. 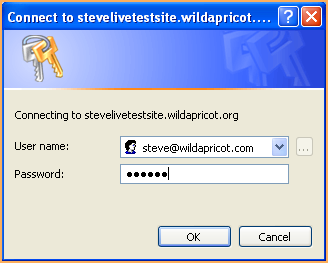 stevelivetestsite.wildapricot.org). 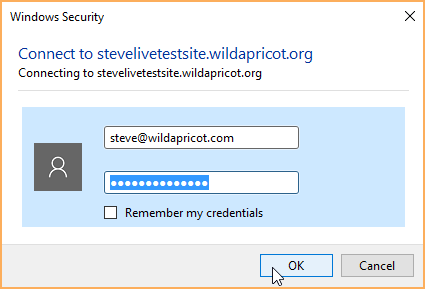 In the Verify Certificate dialog, select Registered user and enter your Wild Apricot email address and password. Select Remember this password in my Keychain if you want to store your user name and password on your computer. You can now access your WebDAV folder in your Finder window side panel under Shared.